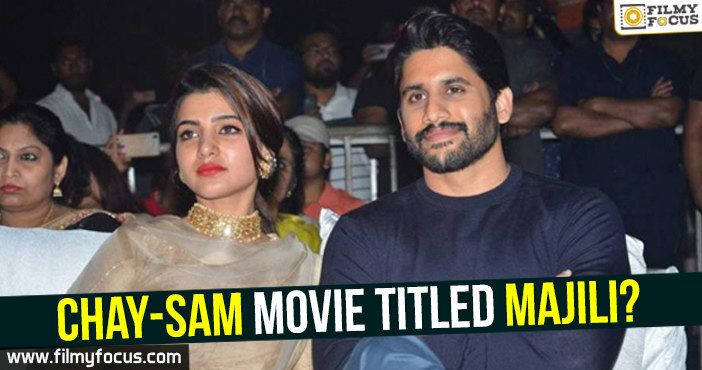 You are at:Home»Featured Stories»Chay-Sam movie titled Majili? Naga Chaitanya and Samantha Akkineni have been the cutest couple ever in recent times and they manage to spread laughter and positivity all around wherever they go. Samantha especially has a very positive reputation as a girl who is friendly and cordial to anyone that respects women. Naga Chaitanya is known to be bit reserved but very jovial once he opens up. With such a couple, it is always a great thing to travel and know more. Bringing that aspect on to the screen with contrast characters to their off screen persona, Shiva Nirvana has decided to write a romantic comedy with married couple as his leads. Interestingly, their journey won’t be smooth it seems. As per sources, Naga Chaitanya will be seen extremely talkative and Samantha, a girl who is slow. Both get married due to circumstances and they find love after marriage, it seems. The buzz is that the director wants to title the movie, Majili and mostly it will be confirmed once the shoot starts from September, it seems. Well, Chaitanya and Samantha’s on-screen chemistry is extremely liked by many and this one seems to explore it a complete different style. A journey with a destination indeed. Did you get your relationship advice from #ChaySam?